Rain, rain go away! I can hardly wait for warm weather and outdoor summer parties. As I mentioned on Monday, striped shirts and cargo jackets are staples in my closet and lately I've been living in them. I think I've worn a different striped shirt every day for the last four days. I also seem to always grab this vintage pleated skirt when it rains (seen before here). It's length and thick material keep me warm in this gloomy weather. Love this look ~ each piece is such a classic! 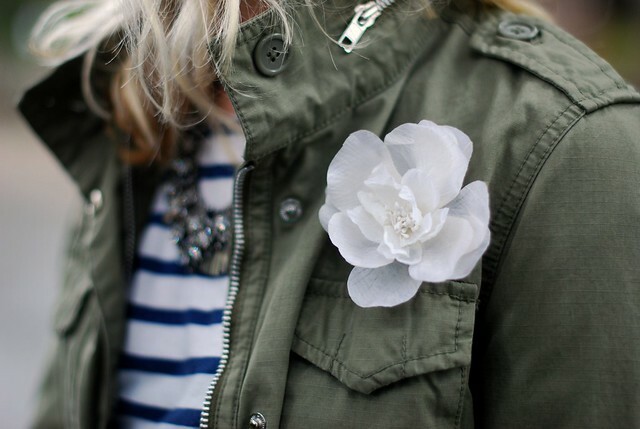 i love the flower you pin on your shirts / jackets sometimes, its so cute! you look so cute and fresh! You look so chic, even when the sun has gone into hiding! Def agree that I can't wait for the sun to come back! The bay area's weather has been so tricky lately! Stop by again soon and be sure to enter my giveaway!! xoxo! great look!! I especially liked the skirt! What a super cute "rainy day" outfit! The little floral brooch is a the cherry on top. Love this! Such a cute rainy day outfit!!! Loving this rain day outfit Taylor! Not many can look gorgeous and stylish in the rain, but you definitely can! 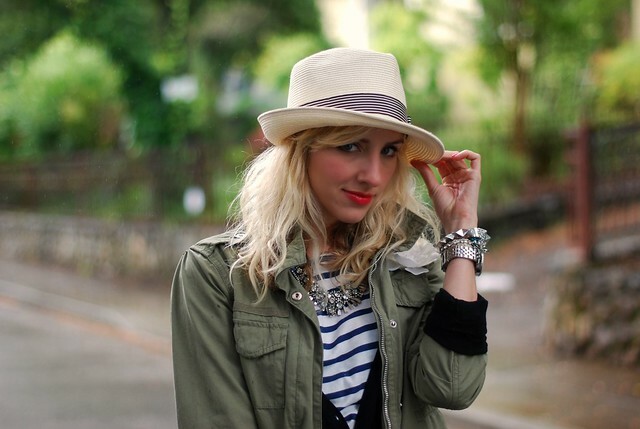 I always love how you pair cargo jackets with sweet feminine pieces! Great great outfit. Love the skirt and that necklace is GORGEOUS. You look fantastic! This is a favorite. To wear the pleated skirt with that jacket is just full of style!! You inspire me to get more creative! I love all the variations of the cargo jacket you have been showing... another amazing look. See, this is just the kind of thing I need--cute rainy day inspiration. It's been one giant puddle here in NY all week, and I always find myself at a loss for what to wear in craptastic weather. Thanks for giving me ideas on way to spruce myself up on drippy days! So cute I love the pleats! Such a cute rainy day outfit! Super cute taylor! I love the skirt!! Thanks everyone! I actually got this vintage skirt off Etsy! This skirt makes me smile! I saw the cutest one in Urban Outfitters and went back to get it a few days later and it was G.O.N.E. This reminds me of it and I love how you styled it! I'm not really a skirt kind of gal, but I love that skirt!! Can't believe you found it on Etsy! Love these shots! Major props to your boyfriend for being such a great photographer. He needs to start a photography blog or something. @Dancingbranflake thank you! He's trying! He's gotten a lot better and we are mindful of lighting. Pretty look Taylor! I need a pleated skirt. Badly. Thanks everyone!! I really lucked out with this skirt! Such a beautiful skirt!!! Love the flower pin too! You look so pretty, girl! Love this look from head to toe! So cute. Love that gorgeous skirt. Great photos!! Come stop by! Giiiiiiirl, you look so amazing! I love, LOVE that clutch... And your coat is adorable! i love this outfit! such a mixture of styles, yet it works perfectly - stunning! just found your blog and fell in love with it! your outfits are so great! i really like this one, especially the hat and the shoes! that skirt is fabulous! i am loving the pleated look. this outfit is pretty darn awesome, love how all the pieces come together!! I love this outfit, your lipstick is a very nice shade!